String art is all the craze right now! 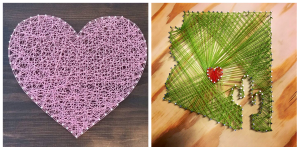 Come to have a fun and entertaining STRING ART NIGHT with us ! BYOB, feel free to bring your own snacks or food – and craft the night away! Arrive 15-20 minutes early uncork and grab your seat! If you desire more time to unwind, visit with friends and breathe before we get crafty, feel free to arrive up to 30 minutes prior to start time; get your Happy Half Hour on! PAYMENT POLICY: Payment is due at the time of the reservation to guarantee your seat. REFUND/CANCELLATION POLICY: A store credit will be given for individuals with at least a 24 hours notice. “No shows” will not be issued store credit or refunds. Groups of 5 or more must cancel 2 days before the date of the class. (Please leave a voice message if calling after hours, (602)341-3570. If you are late to the class you may not be allowed to craft or paint and your payment will be forfeited. Craft Nights by The Hippie Hobby reserves the right to cancel classes for unforeseen circumstances. Registrants will be notified at least 24 hours prior to class. You must be 21 to attend our event at this location. Can I bring my own wine or alcohol? Will you have food there? No, but you are welcome to bring in your own snacks or food! We do not offer refunds. We buy supplies in advance and hours of commitment on our end go into making this a fun and awesome night! If for some reason you are not able to make it we are happy to make arrangments for you to pick up the materials and instruction to complete your craft. No exceptions. No, you can bring an electronic version. We’d need to know ahead of time – just email us [email protected] and we’ll be happy to help you!